Harold D. Shannon, born on 16 September 1892 at Chicago, Ill., enlisted in the United States Marine Corps on 17 October 1913 and served in Mexico in 1914. On 5 July 1917, he was appointed Second Lieutenant in the Marine Corps Reserve and was subsequently commissioned Second Lieutenant in the Marine Corps. From October 1917 through the end of World War I, he served in France and was awarded the Silver Star and the Croix de Guerre for his actions during the Belleau Wood Campaign. In October 1919, he returned to the United States. Over the next 20 years, he served at various stations in the United States and completed tours in Santo Domingo, Nicaragua, and the Panama Canal Zone. In July 1941, he was transferred from San Diego to Pearl Harbor; and, in September 1941, to Midway Island. He was awarded the Distinguished Service Medal for his leadership in the defense of that island during the Battle of Midway. Colonel Shannon remained on Midway into August. He was then transferred to Pearl Harbor; and, in October, to San Diego, where he died on 16 February 1943. Harold D. Shannon was born in Chicago, Illinois, on 16 September 1892. He enlisted in the U.S. Marine Corps in 1913 and became a commissioned officer in 1917. Serving in France during the First World War, he was decorated for his role in the Battle of Belleau Wood. He continued his Marine Corps service during peacetime, including service in the Caribbean and Central America. 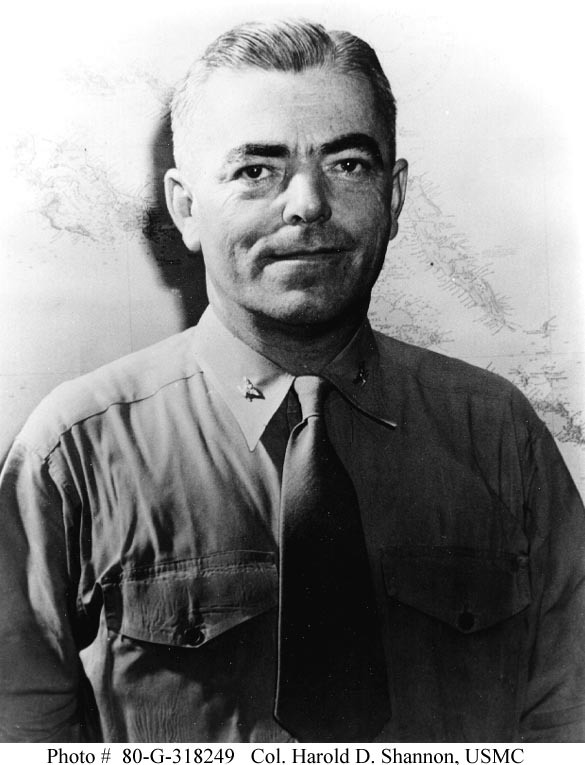 Promoted to Colonel in May 1942, he commanded Marine defensive units at Midway Atoll during the Battle of Midway. 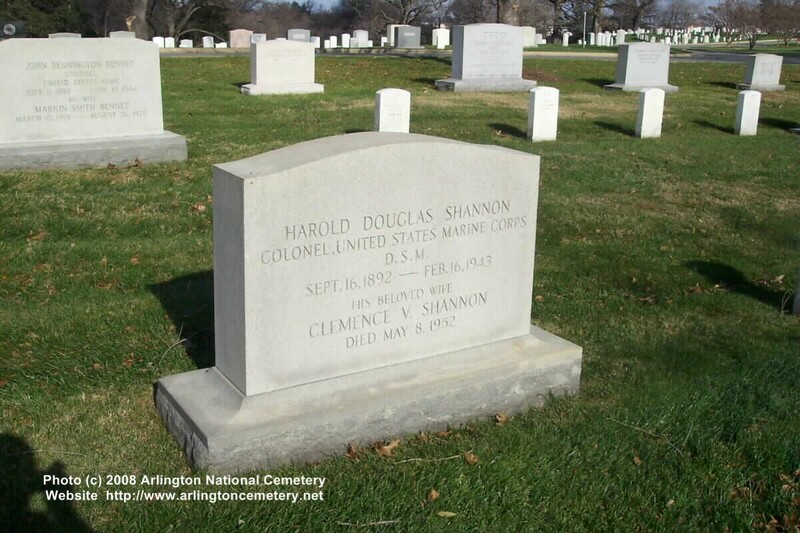 Colonel Shannon later served at Pearl Harbor and at San Diego, where he passed away on 16 February 1943. USS Shannon (DM-25) was named in his honor. Died. Marine Corps Colonel Harold Douglas Shannon, 50, commander of the ground forces in the Battle of Midway; of pneumonia; in San Diego. A much-decorated World War I veteran, he won the Distinguished Service Medal for his Midway defense. Of the four-day battle he observed last fall: "The only Japs that landed on Midway were dead ones."